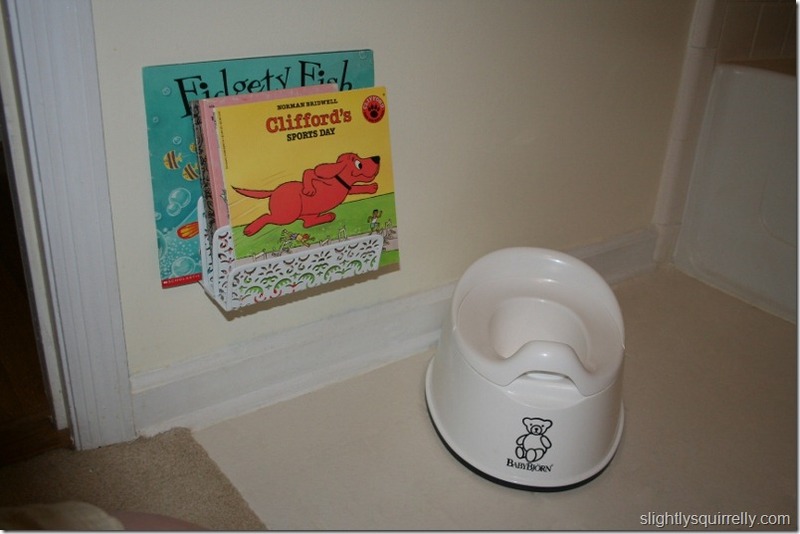 This easy, potty-side, book rack keeps my daughter’s books clean, dry, off the floor, out of my way, and within her reach. Given that my child has over 500 books, it’s not a surprise that she often wants to bring one into the bathroom when she’s doing her business. This posed two minor problems. First, she wouldn’t realize until she was already in the bathroom with her pants pulled down that she didn’t have a book which meant she’d go running off in a tizzy to find one. Second, there wasn’t a good place to set the book before or after the reading. It certainly wasn’t the end of the world, but it was a fun little problem to ponder. I kept my eye out in stores for something that might work. 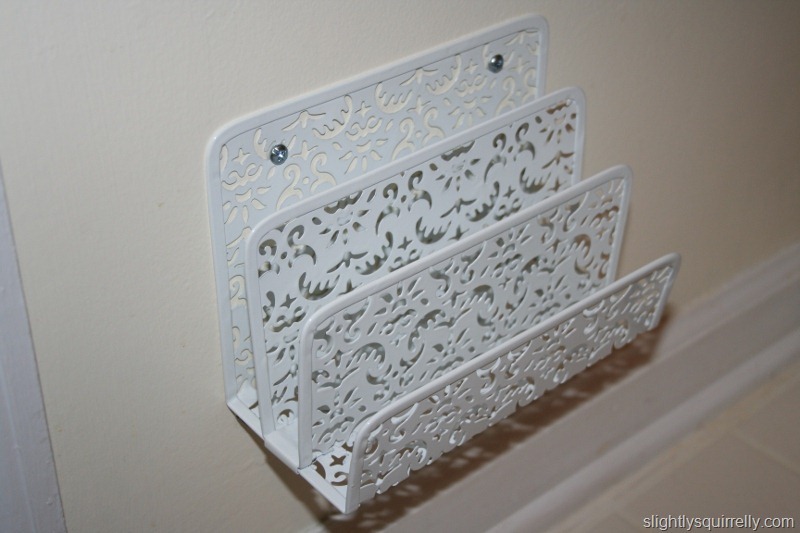 I thought about mounting a long, rectangular bin like one of these drawer organizers, and I looked for something metal at a thrift store that I could repurpose with a little spray paint. In the end, I found this lovely, metal, desktop letter sorter at Office Depot for $7. It comes in black and white. The pattern reminds me of a decorative register vent. Mounting was very easy. The pattern in the sorter is open enough to accommodate a screw so I just chose two open points in the pattern that looked close to equidistant from the edges and level. Although the load on the shelf should be small (< 5 lb. ), I felt using wall anchors was a good idea since a small child can impart a lot of force unintentionally. A 5-pack of wall anchors and screws costs about $2.50 at Lowe’s, making my project less than $10. The anchors I chose are easy to install so the shelf was up in 10 minutes. You drill a hole in the wall, push in the anchor (might need to tap it in with a hammer), then screw the screw into it. I considered spray painting the screw heads white, but figured they won’t show if there’s always a book or magazine in the rack. Time will tell if the anchors will hold up, but right now I’m very pleased with the result, as is my daughter. This entry was posted in Kid-related, Organization and tagged book rack, books, potty time. Bookmark the permalink.